When it comes to figuring out how to best leverage third party services from cloud providers, it’s often a bit of an uphill battle. How do you know what services you really need? How do you know which providers are reputable? Most importantly, how do you know these services will actually provide the ROI the provider has promised? Let’s be honest here, cloud is made up of a sea of technologies and services that can leave any decision maker feeling like a fish out of water. Thankfully, a new cloud champion has started to emerge to help out: the Technical Cloud Broker. Not content with simply reselling third party services, these integrators provide benefits that can help any organization navigate the choppy cloud waters. Technical Cloud Brokers are relatively new organizations who can arguably find their roots in the old system integration and service provider models. Much like Cloud Business Brokers, they help customers deal more effectively with multiple service providers. But their true value lies in the extra integration and insight they provide. For example a customer who purchases several cloud services such as CRM, IaaS and managed security. The Technical Cloud Broker can help them better integrate all these services into their existing environment, while providing additional information about each component. To better explain how this model works, let’s look at a Technical Cloud Broker, Gravitant®. Some background: Gravitant delivers a transformational Cloud Services Brokerage & Management platform enabling enterprises to optimize cloud consumption across public, private and hybrid clouds. 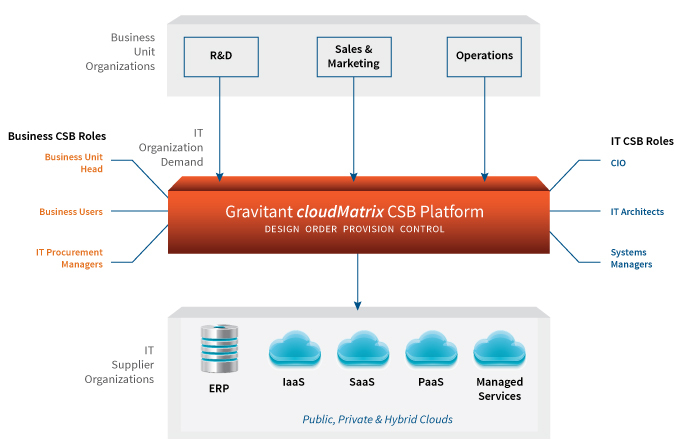 By leveraging their cloudMatrix™ CSB platform, Gravitant empowers enterprise IT to overcome the complexity and risks of cloud services across multiple providers allowing for increased agility, standardization of a cloud consumption model, formalization of accounting processes and implementation of compliance and governance all through a centralized portal. How does it work? As you can see, there are multiple services that get integrated into a single platform. From there, the customer can leverage the platform to provide additional insight into the services. Marketing and Sales can see how the services are impacting their operations, while IT can instantly adjust services, design,order, provision and control service components, and get a holistic, single pane view into their overall infrastructure. As you can see, this model adds significant value over other broker models as it provides additional functionality and insight into how cloud is being used to help organizations make more effective decisions around their cloud services and other processes that they might wish to convert into a cloud model. So why aren’t more standard brokers moving to this model? The key reason is that often these providers have already invested in a service and so creating an all new business model (in this case, the platform) isn’t financially viable. This model is best used by newcomers who are already working with service providers as a reseller, and have the technical ability (this is key) to manage all the moving parts and integrate them into a single platform. In many cases, they may additionally provide security or compliance services, which require a significant investment in resources to manage. So which Cloud Broker model is the best to adopt? It really comes down to the organization. Many firms have significant IT investments including data centres and security teams. In this case, a cloud business broker might be a better bet. For firms who are smaller, do not have these types of resources, or even want to transition their costs from running these operations in-house to a hosted model, a Technical Cloud Broker is probably a better decision as they can alleviate a lot of the headaches that come from sourcing, deploying, integrating and managing these services. After all, I am sure everyone can agree that the real benefit of cloud comes from the ability to simplify and streamline the business model to focus spending on business critical products and services, not services that help keep the lights on.